Seqonomics: What is sequencing going to do to DNA chips? What is sequencing going to do to DNA chips? When it comes to genotyping, DNA chips do a lot of the work. In this post, I ask how cheap sequencing might change that. DNA chips provide information about the presence or absence of a limited number of known variants, but are incapable of providing information about new sequences. In other words, they only provide information about variants that are already known to exist. Despite this, DNA chips are widely used for genotyping, presumably because they're still much cheaper than sequencing, and because they can often provide more accurate information. The applications of DNA chips are widespread: Research both academic and commercial, molecular diagnostics, genetic counseling, personal genomics, forensics, hygiene monitoring, genealogy, and lots of others. The current decrease of next-generation sequencing cost calls into question the dominance of DNA chips and microarrays in many applications. A report by J. P. Morgan from earlier this year states that "In general, we view arrays as a technology in decline, but likely with only modest changes in utilization (up or down) over the next 1-2 years [...] Greater declines are expected in 2013 and beyond". It's unlikely that the all areas of the genotyping market will be equally affected by the emergence of sequencing. 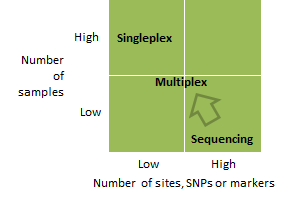 A useful segmentation of the genotyping market is between singleplex and multiplex. Singleplex genotyping only considers a single site in a genome, resulting in a simple yes or no answer about the presence of a genetic variant. Well-known technology platforms include Taqman and Invader. Multiplex genotyping on the other hand considers multiple sites. Well-known platforms include Affymetrix and Illumina. To me it seems that multiplex genotyping is much more under threat from DNA sequencing than singleplex genotyping. The reason is that both multiplex genotyping and sequencing are suitable for interrogating a large number of sites in a small number of samples. Singleplex genotyping on the other hand is more suitable for interrogating a low number of sites in a large number of samples, and is therefore less under threat from DNA sequencing. Other advantages of singleplex genotyping compared to sequencing are that the turnaround time is quicker (in the region of one hour, compared to at least two hours for the fastest sequencers), less need for sample preparation, and lower data management costs. The emergence of cheap sequencing may even be an advantage for current singleplex platform providers: Sequencing may drive discoveries which in turn may increase demand for singleplex genotyping. In summary, to me it seems likely next-generation sequencing to be a threat to more sophisticated multiplex genotyping, whilst singleplex genotyping may not be affected or even benefit. Do you consider this to be a sensible assessment, or am I missing something important? Sequencing will have a significant impact on singleplex genotyping, as many of those tests do not really make sense in this format -- they are historical artifacts. It will be far cheaper to provide multiplex assays covering many markers than to sequentially test individual markers. Example: in lung cancer it is not uncommon to test for KRAS mutations, then if KRAS negative test for EGFR, then if still negative test for another marker and so on. Similarly, an infant with odd symptoms might be tested for one rare genetic disorder, then another, then another. The cost of sequential tests, even without considering the medical costs of waiting to hit the right test, soon overwhelm the cost of a single multiplex assay. Hi! This is a good read. You have such an interesting and informative page. I will be looking forward to visit your page again and for your other posts as well. Thank you for sharing your thoughts about multiplex assay in your area. I am glad to stop by your site and know more about multiplex assay. Keep it up! Multiplex PCR for applications requiring the amplification or sequencing of DNA or RNA. More recently new technologies have been introduced that allow the testing of multiple biomarkers in a single assay. Doing this with immunoassays is difficult and the level of cross-talk between individual assays within the multiplex are difficult to measure and often lead to significant variation in results between labs and over time.